Comfort and safety are the two most important things for an infant. In the immediate weeks following your baby’s birth, they’re at their most vulnerable. Leaving the comfort of the womb is a shock to a baby’s system, so anything that can ease the transition helps. Swaddle blankets may be the best choice for this transition. Not only do they offer warmth and security, but they also stifle the moro reflex. This issue affects newborns for about four months and causes them to move their arms, which may wake them from sleep. Swaddling can prevent this, but you need the right blanket for the job. With so many swaddle blanket variants on the market, I knew that my own experiences wouldn’t be enough to compile a comprehensive list. That’s why I’ve enlisted the help of a few parents to help me pick out the blankets that do the job best. Here are 10 of the best, based on my extensive research. Made using 100% cotton, this is a completely natural swaddle blanket. As a result, you don’t have to worry about the presence of any potentially harmful man-made chemicals. Cotton is also a breathable material, which makes this swaddle blanket safe for use throughout the year. The fact that hospitals throughout the United States use this blanket boosts my confidence in it. It also carries the “Hip Healthy” seal of approval from the International Hip Dysplasia Institute (IHDI). As a result, it protects against infant hip dysplasia, even though it bundles babies up tight. You can also customize the blanket to suit your baby’s preferred sleeping style. It has three settings, with one keeping both arms wrapped in the blanket, while another allows one or both arms to hang free. The third setting is for babies who prefer to sleep with their hands to their faces. I particularly like the embroidered messages on the blanket, which reminds parents that babies sleep best on their backs. Take note of this, as you raise the risk of Sudden Infant Death Syndrome (SIDS) if your baby sleeps on their side. The sack design also stands out for several reasons. While it offers enough room for kicking, babies aren’t able to kick it off entirely. Furthermore, the base of the sack houses a zip, which you can use to change diapers without removing the blanket. Unfortunately, I don’t have such a high opinion of the Velcro swatches, which don’t seal as tightly as I’d like. Furthermore, it’s not the biggest swaddle blanket, so babies may outgrow it once they reach the three-month mark. 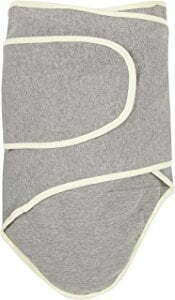 This two-pack of blankets gives you a spare if you have one baby, and may be a great choice for parents of twin infants. The blankets have different designs, with one having a vague floral pattern while the other features black crosses. You can use one while the other one is in the wash, meaning your baby always has a fresh swaddle blanket. I like the use of muslin cotton, as it’s a lightweight material with no harshness. The material breathes well, and won’t scratch your baby’s skin as they sleep. They also have Global Organic textile Standard (GOTS) certification, so there aren’t any harmful chemicals to worry about. The blankets are each 47 x 47 inches, which offers plenty of room for kicking babies when used for swaddling. It’s adaptable too, and is just as effective when being used as a regular blanket as it is being used as a swaddling blanket. As a result, you may find that it lasts longer than some of the other blankets on my list. I also like the 30-day money back guarantee, as you can try it before you buy it. If you find this isn’t the right blanket for you, you can return it and try another one from this list. Unfortunately, I have an issue with the materials. Though they do feel softer after each wash, they’re also quite thin. You may notice signs of wear with repeated usage. There are also softer swaddles available on the market. Another 100% cotton blanket, this has a yellow lining and chevron pattern. Suitable for boys and girls, the blanket has a unique triple-wrap design that eliminates the need for Velcro. This is a good thing, as poorly-positioned Velcro can scratch your baby as they sleep. Furthermore, no Velcro means no loud sounds when opening up the swaddle. The design keeps arms secure, while offering plenty of room for little legs to move. There’s a small pouch at the bottom to keep your baby’s legs secure, though you can choose not to use it if your baby’s a kicker. It’s also roomy, offering plenty of space for your infant to grow into over the next few months. Unfortunately, the swaddle blanket doesn’t convert, so you can’t use it as a regular blanket once your baby outgrows it. The triple-wrap design does make it a touch harder to use than other swaddles on my list. You may need to practice a little before you can seal your infant’s arms perfectly. Happily, you do receive detailed instructions on how to use it properly. Furthermore, it’s a touch on the large side. While this means plenty of space, it also means it may be too loose for infants who weigh less than seven pounds. Coming in a pack of four, this may be the best choice for parents who have several infants to take care of. Better yet, those with one baby can use a couple at home, and give one or two to other caregivers. Each blanket has a different design too, with none of them using harsh colors that could distract your baby. They’re all made using muslin cotton, which gets softer each time you wash it. They also come pre-washed, so you can use them straight out of the packaging. Each blanket is also 46 x 46 inches in size, meaning they offer enough space for most infants while keeping them secure. I really like the label on the edge of each blanket, which details a three-step process for making a swaddle. This makes it easier for novices to figure out what they’re doing. It also means that you can’t lose the instructions, as they’re attached to the blankets. While designed with swaddling in mind, these blankets are versatile. You can use them as regular blankets or as privacy throws too. This means that they can stay with your baby beyond the moro reflex period. Having said that, they do have some issues. The muslin cotton feels soft enough, but it also seems to have a slightly different texture to other muslin cotton blankets. Fussy babies may be able to tell the difference if you’ve used a different blanket before. Another multi-swaddle bundle, each of these three blankets sport a different design. One has a regular pink coloring with red trim, while the others have either hearts or multi-colored elephants. Babies look cute when they’re wrapped up, plus they may grow attached to one of the designs. Made using 100% cotton, they have little fabric wings for fastening. These use the hook and loop method of attachment. However, they also use Velcro, which may be an issue if you want to avoid noise made when opening it. I was particularly impressed with the presence of harness slits. These are great for when you want to keep your baby comfortable during car journeys. Just slot the restraints through the slits to secure your baby while they sleep in the blanket. Designed specifically for swaddling, you can use this as a regular blanket as your baby grows. However, you can choose from two sizes. 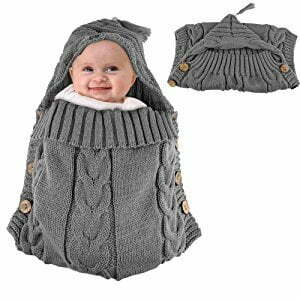 The small/medium size is fine for babies up to 26 inches and 14 pounds, while the large design caters for infants up to a maximum of 18 pounds and 33 inches in height. Having said all that, the material doesn’t feel as soft as I would like. This may cause your baby to fidget and get their arms loose. These three swaddles all have different designs, so you can switch to another if your baby dislikes one of the patterns. 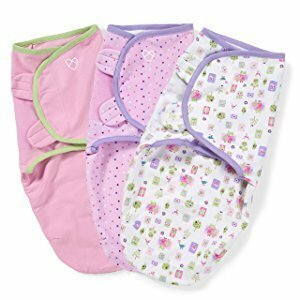 Having three also means you can wash the swaddles more regularly, or give one to another caregiver. It’s also available in three sizes, so you can choose whichever suits your baby’s development. Each also comes with a leg pouch, which you can open easily to change stinky diapers during the night. It has fabric wings which fasten to the side, while a Velcro strap keeps the center in place. Like the original SwaddleMe, it also has harness slots dotted throughout. These should work with the majority of five-point harnesses, but they aren’t universal. Larger straps won’t fit through the slots, so keep that in mind if you’re thinking about using the blankets while traveling. They’re made using 100% cotton, which is thick and soft. I like the lack of polyester, because I find that 100% cotton doesn’t scratch sensitive skin as much. Of course, you have the loudness issues with the Velcro, so this may not be the best choice for babies who startle easily. I’d also prefer a one-size fits all solution, rather than having to cycle up as your baby grows. Despite the name, these aren’t really adjustable. With a simpler design than most of the other blankets on my list, this blanket wraps easily and has versatility going for it. However, the little bandana is my favorite thing about it. 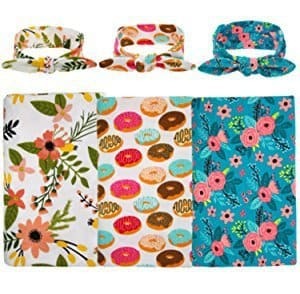 Matching the design of the blanket, the bandana keeps your baby’s head warm as they sleep. Furthermore, it makes for some great photo opportunities. Habibee uses knit fabric for the blanket, which means it stretches alongside your baby. However, you have to be careful when washing it, as machine-washing may cause it to stretch too much. You’ll have to hand wash it and allow it to air dry to avoid any issues. It’s also one of the smaller blankets on this list, coming in at 33 x 33 inches. 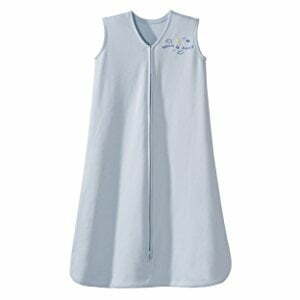 This may make it ideal for newborns and infants up to the age of three months, but older babies may outgrow it despite the stretchy fabric. When secured, you’ll notice the swaddle has plenty of space at the bottom. This is great for allowing babies to kick and move their feet. However, it may cause the blanket to crawl up smaller babies, so you may need to tie it up if you notice any movement. The headbands aren’t perfect either. While they contain elastic, you may find they’re too big for smaller babies. Too much tying to remedy this issue creates knots, which disturb your baby’s sleep. The four blankets in this pack each have a different animal design. Birds, elephants, giraffes, and moneys make up the set. I particularly like the amount of white space between the pictures of the animals, as this means the blankets offer visual stimulus while being neutral enough not to distract your baby from sleep. 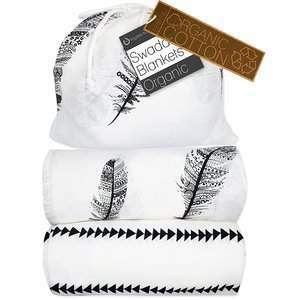 Each is 100% muslin cotton, and the blankets come pre-washed so you can use them straight away. At 47 x 47 inches, they’re versatile and should work fine for larger babies. You can use them just as well as stroller covers or changing mats as you can for swaddling. The breathable cotton may make them a good choice for parents who live in hot climates. However, the single-layer design may not be the best for babies who need protection from the cold. I do like how the blankets get softer with each machine wash though. Unfortunately, the single-layer design may count against the blankets with repeated washes. You may find that the fabric starts to fray, or that loose strings become a problem over time. I’d also avoid washing them with other fabrics, at least for the first few washes. They have a habit of collecting lint from other fabrics when they’re brand new. Unlike most other swaddle blankets, these don’t rely on wrapping and fasteners to keep your baby secure. Instead, they have a pod design, with a front zip to keep babies secure when placed inside. The pods curve inwards at the side to keep arms secure, before curving back out to offer some room for legs and hips. SwaddleMe uses a blend of 93% cotton and 7% spandex for the pods. Some parents may balk at the use of a man-made material, but I don’t think it’s a problem. Plus, the spandex allows the pods to stretch with your baby, and add some breathability. I also like the zip because it barely makes a sound when used. As a result, you can unzip the pod to change your baby’s diaper, and then zip it back up without disturbing your baby’s rest too much. It is a bit on the small size, so it’s best used for newborns and infants up to three months old. SwaddleMe says its fine for babies up to 26 inches tall, though you may find babies near that maximum feel less comfortable in the pod. I’d also prefer the label to be on the outside of the pod, or not there at all. Its current position on the neckline may disturb sensitive babies. Perhaps one of the thickest baby swaddle blankets, this combines knitted wool with cotton thread to create a swaddle that leaves your baby feeling nice and toasty. Obviously, this means that it’s not ideal for parents in warmer climates. For the rest of you, I really like how simple this swaddle is. Like with SwaddleMe’s pods, you just slot your baby into the open space, instead of having to figure out how to wrap the blanket. There are four buttons running along each side, which keeps the blanket secure. There’s also a hood, which connects to the main blanket. This offers some extra padding for your baby’s head, plus it ensures that less heat escapes through the head during cold nights. There’s plenty of fabric securing the wooden buttons to the blanket, so they shouldn’t fall off in the wash. The hood also has a tassel on top, though this isn’t as secure as the buttons. You can machine wash it at low temperatures, but I wouldn’t run the risk. Hand washing and air drying tend to work best for knitted materials. Also, while it says it’s suitable for babies up to 12 months, you may find that larger babies outgrow it quicker. You may wonder why your infant needs a swaddle blanket. As previously mentioned, they mimic the tight conditions found in the womb, and also prevent the moro reflex from waking up babies. However, it goes a bit further than that. Extra coverage is the key, as swaddle blankets won’t slip during the night and leave your baby exposed. They wrap around the entirety of your baby’s body, keeping their arms and legs secured in the process. Furthermore, this tight wrapping means there’s no lose fabrics in your baby’s bed. Some babies gnaw at their blankets in their sleep, which may present a choking hazard. 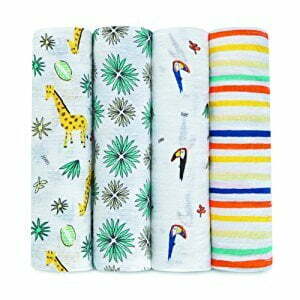 Swaddle blankets avoid this issue because they offer nothing for your baby to grab onto and chew. Traditional swaddle blankets offer the most versatility, as you can use them past the swaddling stage too. Furthermore, you can adjust the blanket to fit any size of baby. However, there’s a very specific technique to learn, which may trip some inexperienced parents up. Swaddle sacks have become more popular because of their simpler design. They usually feature Velcro, or something similar, to seal the blanket in place once you’ve wrapped it around your infant. They’re easy to use, but you have to pay more attention to the size. Swaddle pods are similar to sacks, but they don’t require any blanket wrapping. You just pop your baby inside and seal the pod. While this makes them easy to use, it also means they’re not versatile. Swaddle pods work well for infants below three months of age. Swaddle sacks are better for larger babies, though you need to cycle through sizes. Blankets offer the most versatile solution, but are more difficult to use. Figure out which design appeals most to you, and suits your baby’s needs. Inexperienced parents may prefer a pod or sack until they understand swaddling enough to use a blanket. While you’re looking for tightness in a swaddle blanket, this shouldn’t extend across your baby’s entire body. In particular, a swaddle blanket must offer enough room for babies to move their hips and legs during the night. On a practical level, this allows your baby to kick while wrapped in the blanket. However, it also protects your little one’s hips. If your baby can’t move their hips, they have an increased chance of developing hip dysplasia, which will affect them later in life. Furthermore, you have to consider your baby’s size when choosing a swaddle. If the swaddle is too big, it may creep up as your baby moves in their sleep. At worst, this could cause the material to block your baby’s face, restricting their breathing. Now that you know some of the key information about swaddle blankets, let’s look at some other things that you should keep in mind. Climate-Relevant Materials: Typically, swaddle blanket manufacturers use either cotton or wool in their blankets. The former works best for babies in hot climates, as it’s a breathable material. However, you should look at wool or multi-layered blankets if you live in a cold climate. Easy to Use: Swaddle pods and sacks tend to be easier to use than regular blankets. They have seals, and wrap around in specific ways. If you’d prefer the versatility of a blanket, look for one that offers instructions on how to use it as a swaddle. The Size: Many manufacturers intend for their swaddle blankets to be used for the first four months of a baby’s life. Some also develop smaller blankets for use with premature babies (sometimes referred to as “preemies”). Check the sizes to find a blanket that suits your baby now, and grows with them. Added Extras: Some swaddle blankets come with hoods, which keep your baby’s head warm at night. You can use others in several ways, while some also have harness slits. Check the extra features before buying to avoid disappointment. With this list, I’ve tried to examine at least a couple of items for each type of swaddle blanket. Whether you’re looking for a pod, sack, or traditional blanket, you should find something on my list to suit your needs. I also hope that the additional information provided about each will help you to make a good decision. Read each entry and consider whether the swaddle blanket suits your baby’s needs before making a choice. Each has something different to offer, but none of them are perfect. For example, you may find that you prefer the convenience of machine-washable swaddles to those that you have to hand wash.
Look at the extra features, if there are any, and keep safety in mind. Tightness isn’t the only deciding factor when looking for a swaddle. With this information in hand, you should be able to find a great swaddle that will last through your baby’s first few months.